At the conclusion of a cruise on Azamara Journey into Costa Rica in Feb 2016, we added a 5 night stay at La Paloma Lodge organized by Costa Rica Expeditons. CRE arranged for us to be transferred from the ship in Quepos to Drake Bay. 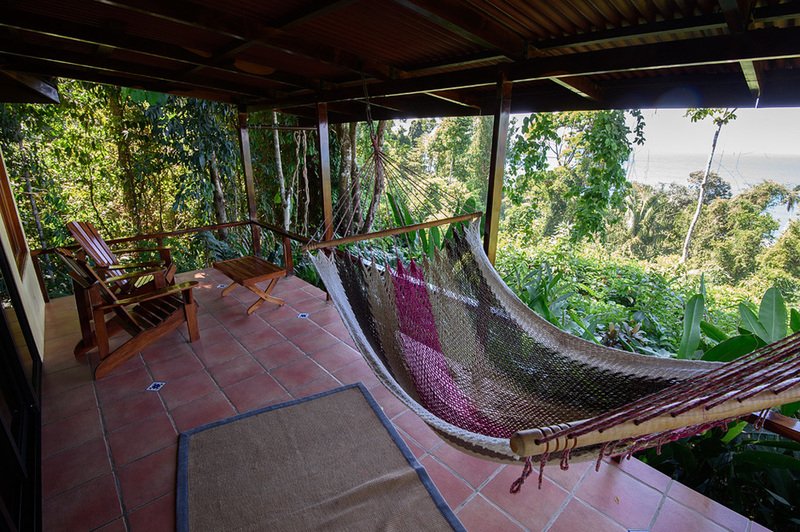 It had been our dream to return to Costa Rica specifically to stay on the Osa Peninsula and visit the Corcovado National Park. (Please click to see our prior trip reports Arenal and Manual Antonio and Torteguero. Costa Rica Expeditions suggested La Paloma Lodge in Drake Bay on the Osa Penisula as a base for our adventures...and the adventures started as soon as we left the ship! There a few ways to get to Drake Bay - one is by small plane, another is by boat from the town of Sierpe. Because it was easier for us to transfer by driver and boat, we did that. But it seemed that we had a lot of drama on this part of our trip! First our poor driver waited over an hour for us because he never got the notice we sent two weeks earlier that our ship was going to be delayed an hour arriving in port. Fortunately, he was a true professional and waited patiently for us as we hustled ourselves and our luggage off the ship on on of the first tenders. We went along with no trouble till we arrived in a small town where a bridge crossed a river to get to the town of Sierpe. Lots of police cars were parked at the entrance to the bridge. it looked like an alarming scene...and yet, none of the Tico's seemed very alarmed. Everyone put their cars in park and headed for the shade. Our driver spoke a bit of English, and we spoke a bit of Spanish, but this event transcended our collective vocabulary skills...Policia? Bridge? Accident? Protesta? This is the part in the movies where things get really hairy! The hero grabs the heroine and they start running! Only this is Costa Rica...they have a saying whenever things go sideways-Pura Vida! It means the "pure life", but translates generally to mean "no worries"! Well, this looked concerning, maybe we SHOULD be worried. After our driver got the scoop from the folks waiting at the bridge, he placed a call to our travel agent, and explained the predicament-in Spanish. Then he handed us his phone and the agent explained to us- in English, what happening. I'm sorry but it won't make a very exciting movie plot. It seems there was a group on the bridge protesting a nearby construction project. Traffic was stopped in both directions, police were closing in on either side...would there be tear gas? would protesters be tossed into jail? Um, no, the police had explained that the protesters planned to protest until noon, then they would be leaving for a bite to eat, and police were there to assure that traffic moved along peaceably after the protest, so everyone could get safely across the bridge and on their way. Pura Vida! Unfortunately, our ferry was scheduled to leave at 11:30 AM. We settled in for a bit of wait, thankful for the AC in our transfer van, Jeff editing photos and I did some writing. We knew that our lodge would send a boat for us later if we missed the ferry, but we were trying not to get too upset at missing an idyllic afternoon at the La Paloma lodge instead of in the middle of a peaceful protest. Pura Vida! So we were surprised when the police started directing traffic across the bridge just 10 minutes later. It was only 11 AM, but the protesters must have been hungry! Our driver put the pedal to the metal and we made it to the ferry point in Sierpe just in time to make the 11:30 AM ferry! The shop at Sierpe where you can purchase ferry tickets to Drake Bay, the small boat "ferry" and the mix of lodge guests and back packers headed to Drake Bay. And of course, our luggage...because once the bridge drama was over, we had the luggage drama! We knew we had a weight limit for luggage of just 30 pounds. Because of our cruise, the fact I was away from home for a month and with the weight of Jeff's camera gear, we knew our luggage was over that limit. We carefully packed a pair of carryons well within the limit and prepared to store the rest. Our documents clearly stated "The weight limit for flights or boat trips within Costa Rica does not mean you need to limit yourselves to 30 pounds of baggage for your entire trip to Costa Rica...We will store your excess luggage while you are on portions of the trip that involve flights or boat trips". Most of the other passengers on the ferry were headed to hostels with just a backpacks -huge, overstuffed, definitely weighing more than 30 pounds back packs, but it didn't look nearly as embarrassing as a garment bag and suitcase! Unfortunately, when we entreated the driver to take and store our excess luggage, he appeared not to know what we were talking about. The ferry captain seemed nonplussed and grabbed both large bags and put them on the ferry before we could call the travel agent again. We thought maybe the excess bag storage might be at the lodge, but it didn't take long before the reality set in that we had just brought our baggage on a very expensive trip, because our only way off the peninsula was a small plane flight that was not going to allow those to bags to fly! So, we, our bags, and all the backpackers giving us the "ugly American" stink eye headed along the Sierpe River out to Drake Bay. It's wild ride on a river aptly named (sierpe means serpent) because the river twists and turns until it reaches the Pacific. 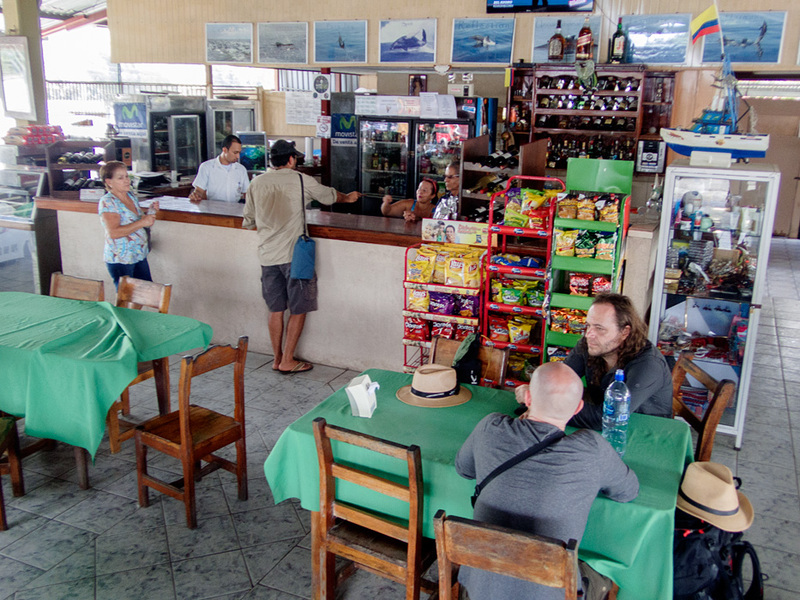 When we arrived, the captain of the ferry called out "La Paloma Lodge" and it was clear this was a pretty upscale place...the back packers glared at us as the La Paloma dock workers off loaded our embarrassing amount of luggage. We sheepishly followed them up the hill to the waiting small luggage truck. We were offered a passenger truck, but as a penance for being overloaded with an embarrassing amount of luggage, we walked up the hill to the lodge, heads hanging low and we walked every time we returned from a boat trip! We explained our predicament to the La Paloma Lodge Manager, who was very helpful in helping us contact our travel agent. Luckily, our agent stood by their documentation and purchased another seat on the plane for our excess baggage. And we were able to drag our embarrassing amount of luggage to the small flight off the peninsula later in the week. The beach at La Paloma and a few of the Rancheros "peeking" out from the water. Click on the arrow below to see a time lapse video of the walk from the secluded Ranchero 7 (the honeymoon suite) to the Lodge. If the excitement of the journey wasn't enough, well, our tour for the evening...a Night Hike with the Tracie the Bug Lady would certainly get the heart racing! La Paloma uses Tracie exclusively for their night hikes, other lodges have their own night hiking guides, but I highly recommend Tracie's tour. She is not only very knowledgeable, and has a passion for insects, but she does and excellent job making the night hike exciting, not scary! She is not only in tune with the creatures "out there", she is also very in touch with how her clients are feeling. She ensured everyone was comfortable, safe, and that we could see what she was showing. Amazingly, we never left the walking path to the lodge. We didn't walk 5 feet before there was another fascinating creature to stop and see. The time flew by and I wished I could have spent another hour out there to see what else there was to see! Tracie and her partner John led our hike. we all wore headlamps which we turned to "red" when we stopped to not blind ourselves or the creatures we were seeing. One of my favorite insects- the leaf cutter ants. These little ants work in a fascinating social world, with differentiated jobs for different groups of ants in the colony. 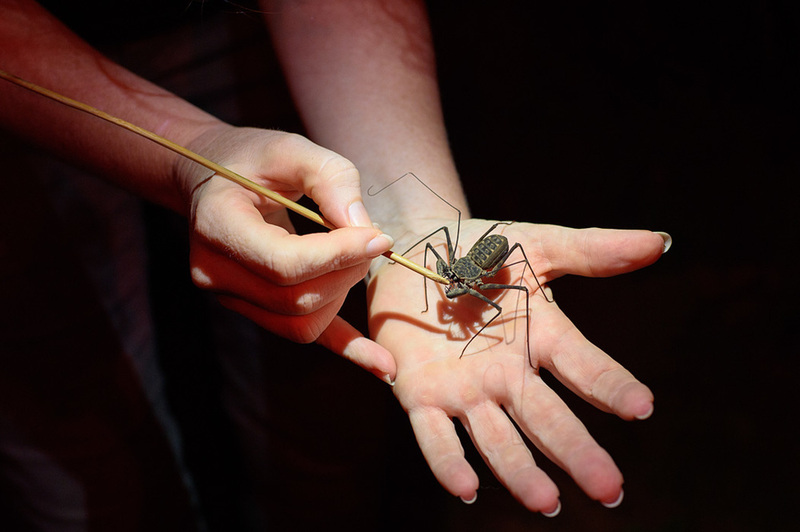 Tracie knows just what is safe to touch and what is not, she also knows how to handle animals and insects so that they stay safe. Her priority is the comfort and safety of both her clients and the creatures! Here she shows us a spider, a type of scorpion and a dragon fly. One of our favorite bugs is the trap door spider that builds it's "hole" perfectly camouflaged in the embankment! Another insect I might have missed! A stick bug several inches long! A little white headed snake (or sock head snake) that lives under the leaf litter. On our second day we had the tour we had most been looking forward to! 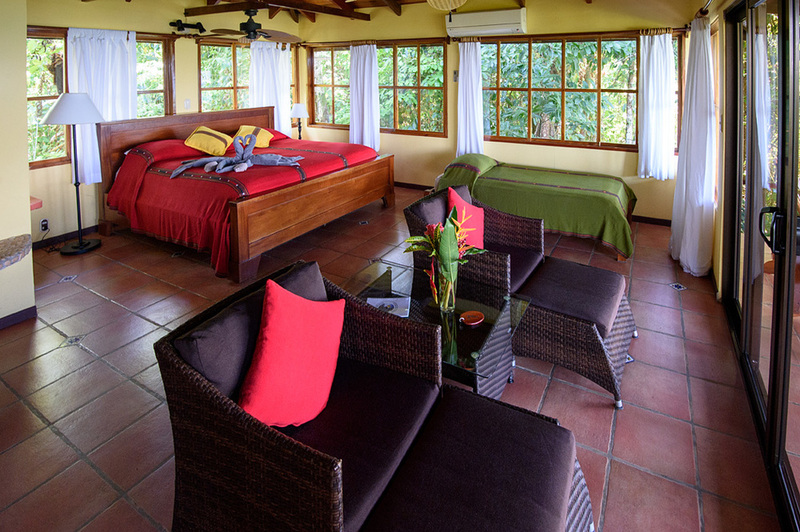 We stayed at la Paloma Lodge specifically to tour the Corcovado National Park. Most stays at the lodge are all inclusive, meaning all meals are taken at the lodge and at least one tour per day is offered. La Paloma is in an area with a walking path to the town of Drake Bay, but it's a very small town. There are a couple of Ranger Stations where you can initiate your tour...La Paloma uses boats to go along the Pacific coast and begins hikes at either San Pedrillo Station or Sirena Station. The Sirena Station hike is longer and a bit "wilder" than San Pedrillo, and that was the one we chose to do. It is about an hour away by boat. To see the animals while they are active, you need to be up early, and we were up at 5 AM! By 6:30 we were on our way to Sirena Station. In the morning after breakfast we met our guide Randall, and our very competent boat captain. At La Paloma you go most places by boat, and the captains are very safety conscious and do a great job getting you where you need to be in all kinds of conditions. We arrived to the landing spot at 7:30 AM despite rough seas on the Pacific slowing us down a bit. Several other boats were also arriving, however, once everyone initially landed and walked the first mile, the groups dispersed and we rarely saw another group. We walked first to the Sirena Station, to sign in and have a rest after the first couple of miles. We spotted wildlife almost everywhere we looked. Including the unusual Bairds Tourgon. We were very lucky with sightings of howler and spider monkeys and our guide snuck into the underbrush to locate a snoozing tapir. The hike was well over 5 miles, probably close to 7. A mile or so from the landing spot, we found the Ranger Station, where we signed in, used the restrooms and then hiked further into the park. Be prepared for a "wet" landing at Sirena Station. The boats back up, wait for a lull in the surf and then the guides hustle everyone off the back of the boat onto the shore. A pair of Redwing Grasshopper mating- the big one is the female. 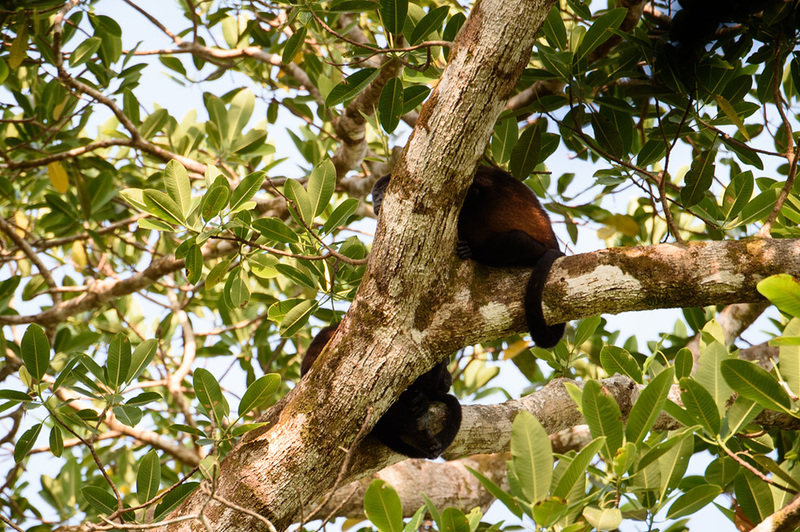 We particularly enjoyed seeing an active troop of Spider monkeys. As we loped around the park, we crossed paths with them several times and got lots of opportunities to photograph them. Use arrows on the photos to scroll through more Squirrel Monkey photos below. This little bird had one of the best names- a whiskery puff bird. One pf our most exciting mammal finds was a snoozing Baird's Tapir, which our guide located in a mud hole. We silently moved into the thicket where it was hiding and were able to get within 10 feet of his muddy bed! During our hike, we saw over 30 different animals and birds. Lunch was a tasty spread of salads and wraps, make your own sandwiches, old fashioned glass bottled soda and homemade chocolate chip cookies. After lunch, our group relaxed on the beach while waiting for the other groups from our lodge to complete their hikes. We returned to the boat at 1:30 PM, and we were back to the lodge at 2:30 pm for a swim in the pool and a nap. Our guide Randall and staff member from La Paloma prepare a delicious picnic! We went to dinner early to use the wifi in the lodge, where we transferred many of my iPhone photos to iPad to make more spaces for more videos and photos on the iPhone later in the trip. If you bring an iphone, the guide can often get close up photos by placing the phone camera right up against the spotting scope. However, I strongly recommend using binoculars. The guide will set up the spotting scope, but you share it with the others in the group. The wildlife is fleeting, while waiting your turn the bird could fly away. Also, looking way up in the canopy with the light shining down makes it challenging to differentiate colors and see behaviors of the animals. With your own binoculars, you can watch the animal while others use the scope, getting full appreciation of the beautiful colors and details (Like the whiskers on the Whiskery Puff bird, or see monkeys grooming each other.) We noticed even while wandering around camp and while on our deck, we saw lots of wildlife including a Toucan, and a resident sloth in a tree high above the lodge. Dinner is offered family style on the open air porch, and is usually a choice of chicken and whatever fish guests caught that day. The fish could not have been any fresher and if you like fish, it is the best choice! We also had a nice salad and lentil soup and a banana cream cake for dessert. A complimentary glass of wine was served at dinner and there was a full bar for other options at additional cost. We sat with two retired couples who travel together from Idaho and California. We enjoyed the well traveled interesting people we met at the lodge and every night, everyone would share their daily adventures! Each evening before dinner, the lodge manager would brief each party about the day ahead, including what to wear and what to bring. For more details on what to pack see our post What to Pack for Costa Rica. Another 5:30 am wake up, and we packed up and headed to the lodge for breakfast and to take our mangrove tour. We headed out with Carlos, our Mangrove tour guide, who got us settled into the boat and we headed back into the mangroves we had left 2 days earlier. Unlike the speedy ride through on the ferry, this time we took our time, stopping at the shore and wandering into narrow mangroves to spot wildlife. 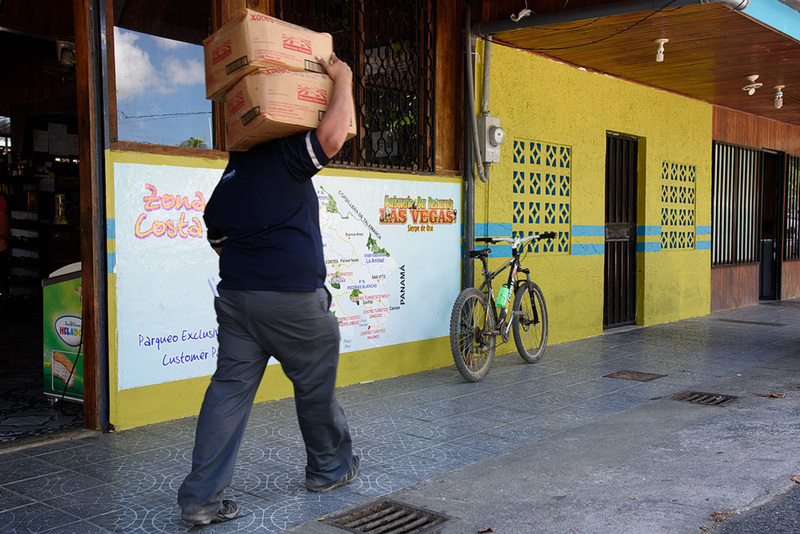 We also made a short stop in the town of Sierpe, where we had started two days earlier. 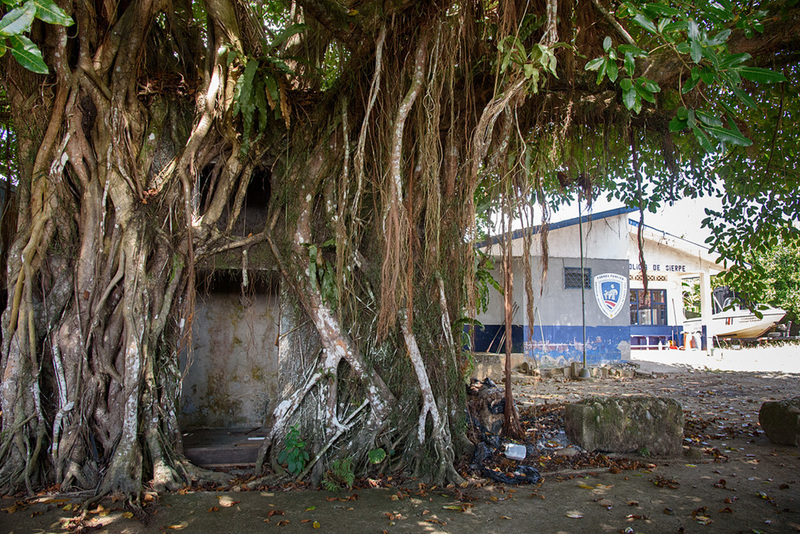 In Sierpe, we saw two beautiful scarlet macaws in a tree and a "Bolla" in the town plaza. These architectural artifacts were uncovered during canal construction probably date to the Pre Columbian natives centuries ago. The wildlife viewing was amazing with abundant birds, but also reptiles and mammals such as anteater, Capuchin, squirrel and howler monkeys, even a white tail deer. We saw two species of bats. 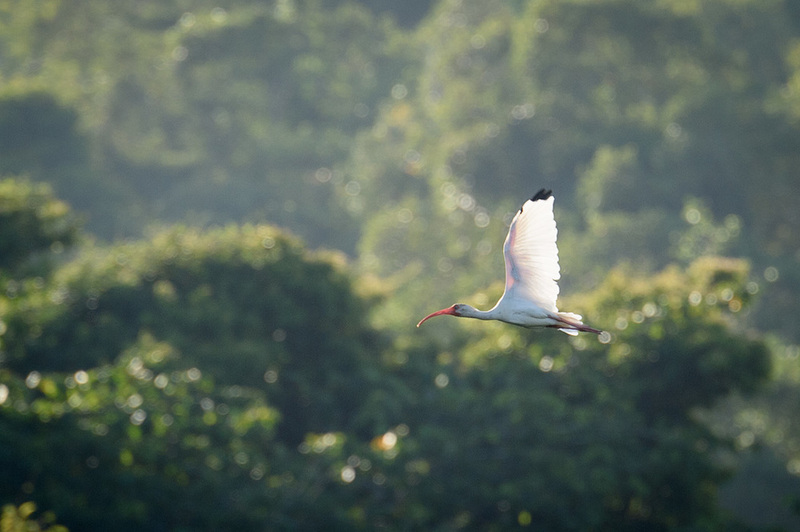 In fact on the mangrove tour we saw over 30 different birds and animals. We returned to the lodge for lunch at 1:15 and had the rest of the afternoon free to relax around the lodge. Use arrows on the photos to scroll through more Capuchin monkey photos below. We visited during the "dry Season" and while things were still quite green, some trees were without their leaves. 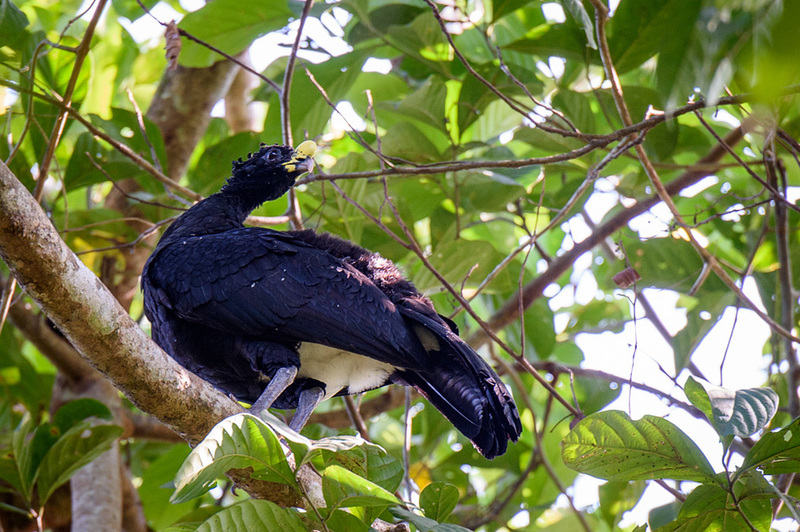 We spotted one of the showiest birds in Costa Rica right in town! Use arrows on the photos to scroll through bird photos below. Would you like to see more Capuchin monkeys? We thought so! We saw lots of them, including this little one "cooling off" by putting his hands in the water. Anytime the monkeys come near the ground they are at risk from predators, but sometimes it gets too hot! Here is an animal some people don't like seeing, but we found it thrilling, a Mangrove Boa curled up in a tree. Our captain pulled the boat right under the tree so we could look straight up and see it's face wrapped in it;s coils! We made our way down some very narrow channels but we also had lots of company with other tour boats just leaving as we entered and entering as we were leaving. Because of the "traffic" and the closeness of the shore, we didn't see much wildlife in these narrow channels. Northern Jacana with it's delicate legs appears to walk on the water balancing on the plants. The guides will generally name the animals for you, and often point them out in the guide book so you will know what you are looking for! Again, I highly recommend your own pair of binoculars, especially on this tour because of the moving boat, the guides cannot use spotting scopes. Also, carry along a small note book and a pen to make notes. Even if you can't spell them, jot the names phonetically will help you find the names in the guide book later. Just matching up the photos in chronological order with the order I made the notes helped me identify many of these birds later with the help of my own guide book, and there is the always helpful Google! A "sleep in" morning, we 7:30 headed to the docks, and had a 45 minute boat ride to Cano Island a Biological Reserve, out in the Pacific within view of the lodge. We saw some playful pan tropical dolphins along the way. (for more photos of Pan Tropical Dolphins see our Golfito trip report here. We stopped at the ranger station to sign in and snorkeled for 45 minutes in a reef from the boat. We took a brief refreshment break on the beach at Cano Island, and then went back in the water for a deeper water snorkel off the boat to look for rays and sharks and larger fish. The boat returned to a public beach at San Josecito, where a picnic was laid and two riotously colorful macaws entertained us after lunch. After a short siesta in the hot black volcanic sand and swim, we took the boat back to the lodge. Our lunch buffet laid out at the beach at San Josecito- actually only 1/2 the buffet, there were salads and meats at the other end! We decided to take the kayaks out down the short mangrove channel fronting our resort dock. The mangrove in front of the lodge isn't very long, there is a way to keep going when the water is high enough, bit the day we visited, it was a bit low. The hanging bridge over my head is part of the walkway into Drake Bay. After kayaking, we enjoyed the sunset at the La Paloma Beach. None of the beaches are "private" in Costa Rica, and this one was shared by a public walkway from Drake Bay. it had dark sand and plenty of shady palm trees, as well as some volcanic rocks in places. it was never crowded, and the water could be rough, but there were little pool areas where the water was calm. The water was so warm it was almost like bath water! Back at the resort we took a quick plunge in the pool to cool off, packed up for our flight tomorrow, and while Jeff shot the sun set on the beach. With only one night left, I sat in the hammock bird watching and writing and thinking about this beautiful wild place! Dinner was curry fish stew or veggie curry stew, or filet mingnon. We sat with our tour companions and had more lively chats on the porch, exchanging contact information so we could all share photographs. We had one last bit of drama that had us jumping out of bed at dawn! Both of us awoke to a tremor, and not being familiar with geologically active areas we were shocked and both leapt out of bed at the same time. Jeff had seen me reading La Paloma's information book earlier and frantically demanded to know what we were supposed to do in an earthquake. I recalled they said get away from windows so we ran to the middle of the room, crouching behind a pair of wicker chairs. After the tremors stopped we looked up and realized the "safe" place we picked was under the main beam of the room and the ceiling fan..maybe not the safest choice! We weren't the only ones surprised...almost immediately a lone howler monkey started hooting in a tree right above our ranchero! Click on the arrow in the picture below to hear the howler money above our room. Despite being a bit "rattled" ourselves, the guides and the staff at the lodge said it was just a tremor, common, and not at all alarming! Tell that to the howler monkey! Sadly, it was time for us to leave. we settled our bill including a tip for the staff, boat captains and managers to share. We took care of each of our professional guides individually, generally about $15-20 dollars per day per person is appropriate for excellent service which we felt we had experienced during every one of our wild life tours. Our trip out of Drake bay started with a boat ride into the town of Drake Bay where we picked up a small shuttle to the airstrip. Now this is not exactly a giant "airport". The fellow in red performs all the functions, does check in, weighs luggage, waves those little red flashlight thingys so the plane knows where to go, unloads the luggage, reloads the plane and then helps with guiding it out again! Once the plane arrives, all this happens in about 15 minutes! Flying over the highlands in small plane is one of the highlights of travel around Costa Rica.